Published by The Greene County Historical Society, date not given. Cover has some wear and light discoloration. Inside pages are clean. 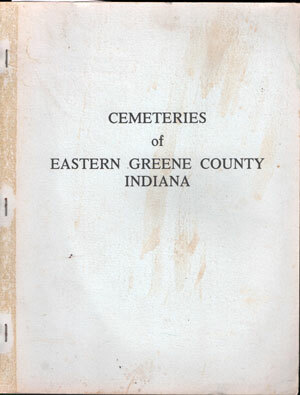 A directory of names with birth and death dates from tombstones in more than 100 cemeteries in Eastern Greene County, Indiana (does not include Grandview Cemetery in Bloomfield). Card stock cover, stapled spine, 300 pages.